Do you take your iron with you to class or a retreat & then have to carry a hot iron home in the car? Then our Hot Iron Holder pattern is for you! Simply place your hot iron in this holder, then wrap your cord & place under the handle. Tie the ribbon & you're ready to go! You can place the iron & its holder in the car without worrying that you'll burn the carpet. 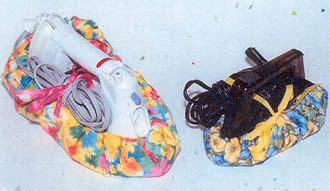 Patterns included for standard size & travel Hot Iron Holders. Price includes shipping and handling.